Moss is air-purifying for your home or your office. Cities like Berlin are installing “moss trees” in streets instead of real trees to fight against city pollution. Moss is also sound-absorbing. The moss’ shape, structure and density allows it to neutralize noises and echo. It is known to contain very well human’s voice tonality. It is often used by companies to isolate meeting rooms and offices. Moss, in opposition to most indoor plants, does not need any light to be kept intact. If you have to close the stores for a long period, there is nothing to worry about. However, we advise you not to expose the preserved moss to the direct sunlight, nor to display it near hot or cold areas (heating, A/C…) as it could damage the moss. There is no need to water the moss, nor to cut it or maintain it. Not even a little bit. The moss is preserved, which means it doesn’t need water and has stopped growing. The moss may have been coloured with an adapted paint, not harmful to the plant. Moss can be kept intact for many years (up to 10 years, and potentially more). Preserved moss is made to last (indoor). When the humidity is high, you may see the moss evolve : it gets a bit more spongy, flexible and fresh. When humidity is low (less than 40% in general), it may also get slightly harder. Those changes are normal and will not alter nor harm the moss at all. Eco-friendly, natural moss has surprising adaptation capacities to its environment : it can resist to very cold or hot temperatures. Its usefuleness for our planet is well-known : it helps conservate carbon, control erosion, is used as a bio-indicator and for water treatment. Moss helps relaxing and brings a good atmosphere. Moss was cultivated by japanese to bring a touch of “zen” and tranquility. Moss is hand-picked in the respect of nature and growth cycles. Moss is preserved with a totally simple and ecologic process, to preserve its aspect and texture over the long-term. 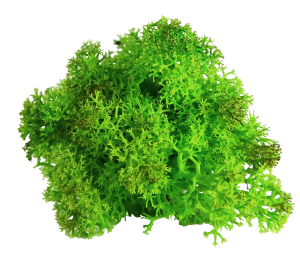 Moss is manually colored with a special and adapted coat that does not hurt the plant. Every moss “ball” is selected and carefully prepared to fit perfectly with the others. Several kilos of moss are sorted to prepare orders. The moss is cut, then cut again and sculpted, before being positioned. Moss is immobilized during several hours on a special and adapted “glue”, to fix the moss to its support. That’s it! It is ready to be hung. Do not expose the moss to direct sunlight : it could loose its colour in an accelerated manner. Do not expose the moss in a humid environment like a bathroom, or outside. Do not water the moss. Do not expose the moss to too cold or hot areas, for example near a radiator or air conditioning. Colors can appear differently according to your screen settings. All creations are made on-demand to garantee freshness of the moss.